You've probably known people that you assume have about the same income as you but seem to live much more extravagantly. Maybe they own a bigger house, drive two new cars or take a couple of exotic vacations a year. Although we can't know their financial situation for sure — maybe they do have more wealth than us — these households are sometimes described as having a "highly-leveraged lifestyle." What we typically mean is that they may be spending most of their income and not saving much. In a financial emergency, like a job loss or medical crisis, these families might burn through their savings pretty fast. Before we retire, we could measure our "lifestyle leverage" by the number of months our savings would last if we suddenly lost our job. Fewer months means higher leverage and more risk. We might cut back on discretionary spending in an emergency, but non-discretionary spending (the mortgage, food, etc.) often makes up the bulk of our budget and it could be difficult to significantly extend our savings in an emergency by cancelling HBO. Furthermore, discretionary spending reduces savings, so being able to eliminate some of it in an emergency only solves half the problem. The greater our lifestyle leverage, the greater our risk of a financial crisis or mortgage foreclosure before or after we retire. There is a different way we can look at lifestyle leverage after we retire by using the calculations from sustainable withdrawal rate studies. The greater the percentage of our savings we spend annually, the greater our risk of outliving them. Following is a chart of this data. As you can see, risk increases exponentially with the spending rate. That means that a small decrease in spending results in a disproportionately large decrease in risk, the probability of portfolio failure. Retirees spending 5% of their portfolio value each year have a 24.7% probability of depleting their savings in thirty years. 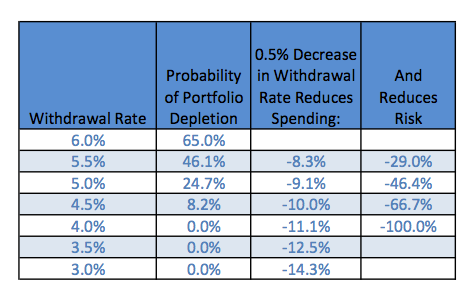 Those spending 10% less, or 4.5% a year, lower their probability of portfolio depletion to 8.2%. A 10% reduction in spending reduces the risk of portfolio depletion by 66.7%. This works on a smaller scale, too. Reducing spending 2.2% from 4.5% to 4.4% reduces risk 29%. Risk is highly leveraged when spending changes. Trimming spending a little can reduce risk a lot. And conversely, of course, spending a little more can increase your risk more than you might expect. There are a number of ways to de-leverage our lifestyle, or said differently, to reduce the amount of spending from our stock and bond portfolio as a percentage of portfolio balance, after we retire. We can decrease the numerator (spending) or increase the denominator (savings). 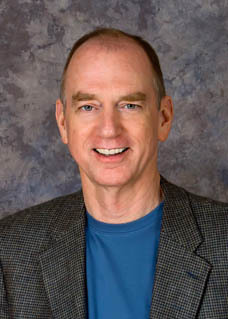 Any reduction of spending, including cancelling HBO and limiting lattes will help by lowering the numerator (spending), but it will probably be difficult to meaningfully reduce risk by minor trimming. Leverage is also reduced when we have a good year in the stock market (increasing the denominator) and increased when we don't. Downsizing our home may both increase the denominator by converting home equity to more liquid investments and reduce the numerator by lowering house payments. Paying off the mortgage may also reduce leverage, sometimes significantly. Paying off the mortgage will reduce spending, but it will presumably reduce the current portfolio balance by the amount of the mortgage payoff. Whether and to what extent the leverage ratio will be improved depends on whether the ratio of the current principal and interest portion of your annual house payments to the mortgage payoff amount is greater than your current spending ratio. You can usually find these numbers easily at your mortgagor's website. Assume your current mortgage payoff amount is $100,000 and you pay $5,000 a year in principal and interest (P&I). The ratio is 5%. If you currently spend 4% a year from your stock and bond portfolio and have an adequate balance to pay off the mortgage, doing so will improve your lifestyle leverage, meaning it will lower your withdrawal rate and decrease your probability of portfolio failure. Any P&I-to-Payoff ratio of 4% or less would not improve lifestyle leverage in this scenario. The ratio of mortgage P&I to the mortgage payoff amount changes over time with a fixed rate mortgage. The payoff amount continually declines as you make payments and P&I remains constant, so the ratio grows over time, making it more likely that paying off the mortgage will improve your withdrawal rate. For example, assume you take out a 30-year, $100,000 mortgage at 4%. Your annual payments would be $5,729. The first year of the mortgage, you would pay about $3,970 interest and $1,764 in principal. At the end of year one, the payoff balance would be $98,239 and the relevant ratio would be $5,729 / $98,239, or 5.8%. At the end of year 10, the payoff would have declined to $78,784 and the P&I-to-Payoff ratio would have increased to $5,729 / $78,784, or 7.3%. When this ratio of P&I to payoff balance exceeds your portfolio spending rate, paying off the mortgage will improve your lifestyle leverage and reduce your chances of outliving your savings. Any reduction of spending as a percentage of your current portfolio balance will lessen your risk. That means you have to also keep a careful watch on your remaining savings. Even with constant spending, your withdrawal rate will move up and down with your portfolio balance. What does this mean in a nutshell? 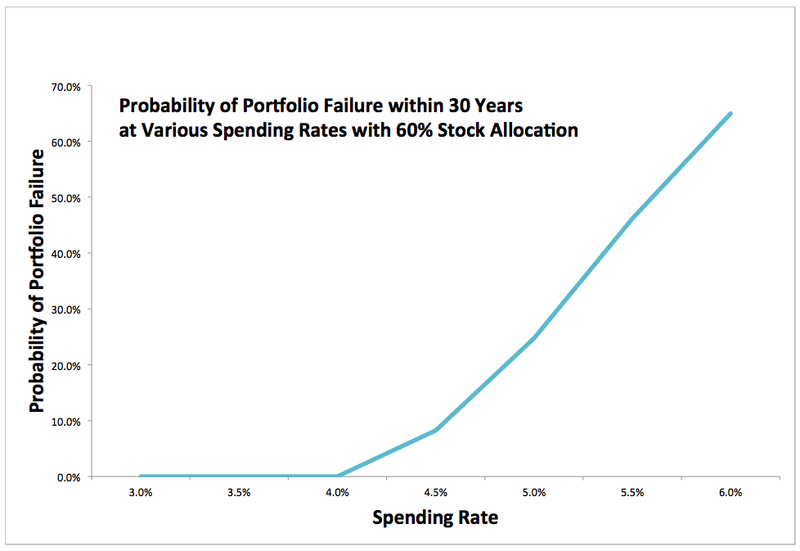 Portfolio depletion risk increases exponentially with the spending rate. Cutting costs even a little can have a big impact on your financial security. This is one more reason to consider downsizing your home or paying off the mortgage, but any spending reduction will help. De-leveraging is an important tool for managing retirement financial risk. For under-savers, de-leveraging and maximizing Social Security benefits are likely to be the two most effective ways to maximize your assets. I like this way of thinking. I'm about 3+ years from retirement and have 6 plus years of mortgage payments left. I was thinking about the sequence of return risk for those first years of retirement. And I think that amounts the same underlying risk for the lower success rates with higher withdrawal rates. My plan for now is rather than pay it off, to keep the payoff amount as a liquid or CD asset. That feels a little safer to me. Namely to have a bigger available buffer on day 1 of retirement. At the expense of a percent or two (taking in account lowers CD rates and interest deductions).